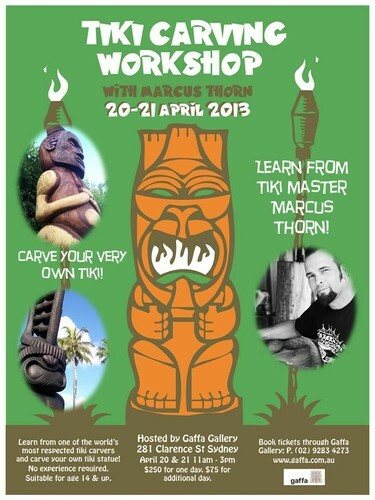 This April Sydney-Siders have the chance to get in touch with their Tiki side in the heart of the CBD! Have fun learning a new skill and take home your very own piece of Island life! Tiki carver and painter, Marcus Thorn of Tiki Beat has been carving Tikis for over 15 years and painting and drawing since his early teens. Heavily involved in the Hot Rod and Low Brow art scene in Australia Marcus is fast becoming one of the most highly respected Tiki carvers in the world. Marcus will be running 2 days of carving workshops from the gallery level of Gaffa creative-precinct. No experience required, suitable for ages 14 and up!